Dover has a series of books called Crochet Stories that combine the sharing of popular stories with amigurumi crochet patterns for the characters in those books. Each of these books is really adorable. The stories are well-known and offer nostalgia for many readers. The characters are inspired, creative and yet easy-to-make. The books offer a great opportunity for a crafter to read the stories to children and also give them their own handcrafted versions of the characters so that they can act out what they hear. Or of course you could enjoy them yourself, creating vignette displays of your own favorite fairy tales populated with characters you’ve crocheted yourself. Today we’ll review three of those books and you’ll have the opportunity to win one in a giveaway. Crochet Stories: Lewis Carroll’s Alice in Wonderland by Pat Olski tells the fame story of Alice in six chapters. Each chapter is about three pages long. At the end of each chapter are a few crochet patterns relevant to the characters or concepts introduced in that chapter. 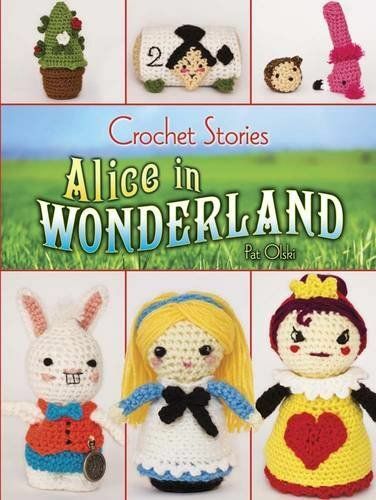 For example, the first chapter has crochet patterns for Alice (as well as Small Alice), the White Rabbit, the “drink me” bottle and the “eat me” cake. Each of these crochet patterns comes with detailed round-by-round instructions and finishing information for creating the amigurumi character. The book has a total of eighteen patterns; once complete you’ll have a full set to tell the story of Alice in Wonderland. 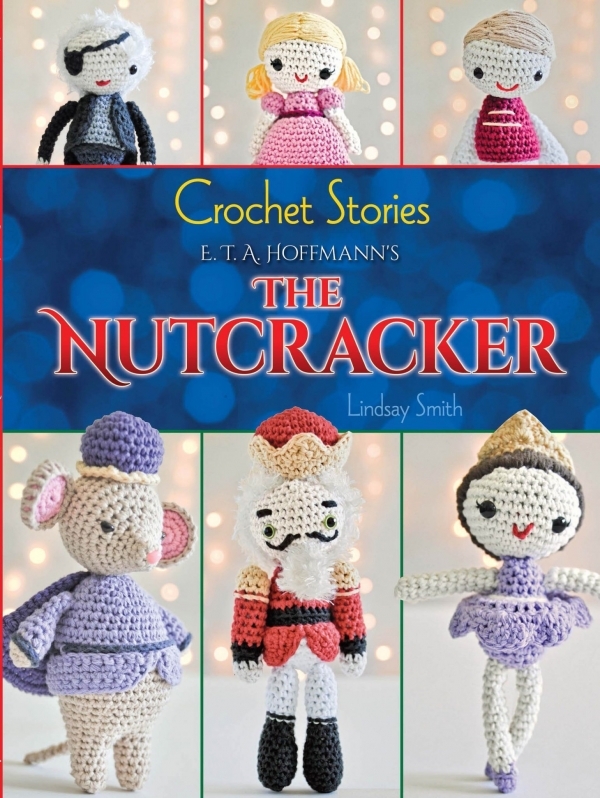 Crochet Stories: E. T. A. Hoffmann’s The Nutcracker by Lindsay Smith is structured similarly, with 10 chapters, each of which is accompanied by related crochet patterns. The early chapters are brief, introducing the story and the characters, with longer chapters later to elaborate on the plot of this popular Christmas story. There are one dozen crochet patterns, some of which are very specific to the story (like The Sugar Plum Fairy) and others that would also work for general Christmas decorating (such as great crochet Christmas tree and a Gingerbread Man). The crochet book has a section at the back explaining certain techniques, including how to add hair to the characters with yarn, through photo tutorials. 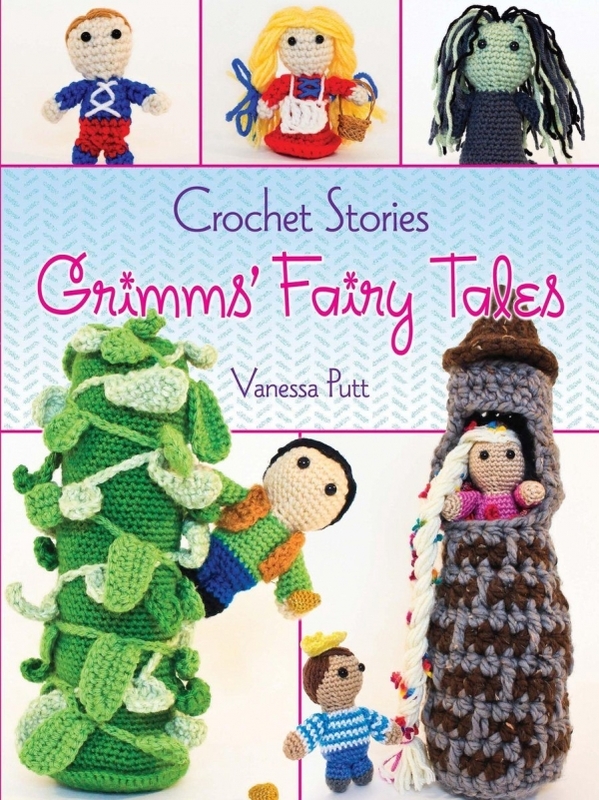 Crochet Stories: Grimms’ Fairy Tales by Vanessa Putt is slightly different from the others in that it tells a collection of stories instead of a single tale. The book begins with general instructions for crocheting all of the patterns in the book and specific patterns for the “basic person” that is used as the starting point for the story characters. The book has five stories (Hansel and Gretel, The Hare and the Hedgehog, Jack and the Beanstalk, Tom Thumb and Rapunzel). Each chapter begins with the story, ranging in length from 4-8 pages. The story is followed by the patterns; Hansel and Gretel, for example, has patterns for Hansel, Gretel, the witch and the gingerbread house. There are a total of 16 crochet patterns in this book. Giveaway closes 12/5/16. Three winners will be chosen; each winner will be allowed to select one title out of these three. Winners announced shortly thereafter via email / social media and books shipped out by publisher shortly thereafter. The Crochet Stories books would make great holiday gifts for yourself or other crocheters you love. Even if you don’t win the giveaway, you can get a terrific 25% discount when you use coupon code WRBA on the Dover craft site through 12/31/16. I would choose the Crochet Stories: Grimms’ Fairy Tales. I really like the collection of characters. I love the Nutcracker. I’d like to make that cast to remind me of the childhood I spent ballet dancing and the small part I got to play as an elementary school child in a local Nutcracker production. Crochet is an expression of my happiness. This is a happy thought. I would love the Nutcracker book! It reminds me of the time my family and I went to see the nutcracker. What a super giveaway – this would be absolutely perfect for my forthcoming trip to South Africa to meet my grandchildren for the first time! The eldest is just over 18months old and my little grandson was only born on 3rd November. I am excited and my head is all over the place trying to decide what to make before I visit them. This would give me the best idea and the little ones will love the crocheted dolly’s. The Grimm Fairytales have been my favorite since I was a little girl. It would be awesome to have this and be able to make the characters and share with my new grandchild. I would love to get the Nutcracker book. I used to be a dancer when I was younger and it was a dream of mine (back then) to dance in that ballet. My dreams have changed, but I still love that ballet. I would chose the Nutcracker – because I love everything Christmas. These all look great! My mother-in-law and sister-in-law have a tradition of seeing a big stage Nutcracker ballet in Chicago every year, and have recently started including my daughter as well. Therefore, my favorite of the 3 is the Nutcracker. Each of these books are amazing! I would choose the Grimm’s Fairy tales because I enjoy the idea of one structural object encapsulating an entire story. A book like this would serve as a great source of inspiration for my own work. The Grimm’s fairytales book is my favorite. Thanks! Wow! All the books are great but my favorite is The Nutcracker. The crocheted characters are so classic and simple adorable! I would choose the Grimms Fairy Tales one. I’m not a fan of the other two. I remember seeing The Nutcracker play when I was very young and it scared the crap out of me. LOL And I just was never a fan of Alice in Wonderland.